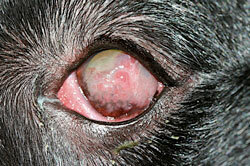 Pannus, or chronic superficial keratitis, is a progressive inflammatory disease of the cornea. Common clinical signs include pigmentation (brown discoloration), vascularization (blood vessel in-growth) and opaciﬁcation (haziness) of the cornea. These corneal changes may lead to scarring and may progress to severe visual impairment or blindness in severe cases. Active disease may result in discomfort. 1. An increased incidence in certain breeds (German Shepherd dog, Labrador Retriever, Border Collie and Greyhound) suggests a genetic predisposition. 2. Ultraviolet radiation and high altitude increases the severity of the disease. Therefore, dogs living at high altitudes and low latitudes often are more severely affected with disease that is more difficult to control. It is most common in the desert southwest and the Rocky Mountain States. 3. Immunological factors are believed to contribute. Pannus is considered a form of an autoimmune disease, in which the body directs an inappropriate immune response against the tissues of the cornea. 4. Many infectious agents have been incriminated. None have been proven to play a significant role in this disease process. The cardinal sign of pannus is vascular or pigment infiltration into the clear cornea, causing whitish, pink or brown discoloration. This typically starts at the outside edge of the clear cornea and extends inward. The blood vessel in-growth and pigmentation of the cornea may progress across the entire corneal surface and in extreme instances, may result in blindness. A diagnosis of pannus is usually made on the basis of characteristic clinical signs. Despite intensive research efforts, no permanent cure exists. However, in the vast majority of cases, the disease progress can be halted and the condition can be managed long-term, especially if therapy is instituted early in the course of the disease. The inﬂammatory cell inﬁltrations and the vessel invasion usually are reversible with therapy, whereas the scarring and pigment depositions often are irreversible once they have occurred. The goals of therapy are to reverse active vascularization and to prevent further progression of the scarring and pigment deposition in the cornea. 1.Corticosteroid therapy may be administered by intermittent injections under the conjunctiva (pink mucous membrane of the eye) and/or by continuous application of eye drops or ointments. This is the main line of defense against progression of the disease. Therapy is usually successful but must be continued lifelong. Even short periods of interrupted therapy, for example 2 to 4 weeks, may cause severe recurrence with devastating effects on the dogâ€™s vision. 2.Topical immunomodulatory therapy in the form of cyclosporine or tacrolimus ointment or drops may improve the condition. These medications can be used in combination with corticosteroids to reduce the frequency of corticosteroid administration necessary to maintain control. 3.Surgical excision of a superficial layer from the affected area may restore vision in eyes with extensive scarring and pigmentation. This is called superficial keratectomy. Unfortunately, the post-operative recurrence rate is high and this method remains a last resort. 4.Beta-irradiation may be used when medical therapy alone is insufficient. Potential complications associated with the use of these medications include, but are not limited to, inï¬‚ammation of the pink tissue (conjunctivitis) and corneal ulceration,-corneal mineralization; some of these complications can lead to blindness if not promptly addressed. Your awareness of your petâ€™s symptoms and compliance with recommendations for medication and recheck examinations help control these potential complications.